A gun show in Albany, N.Y., in 2013. President Obama is proposing that more dealers at such shows be required to impose background checks on gun buyers. When President Obama announces today — a little over a month after 14 people died in a mass shooting in San Bernardino, California — that he is bypassing Congress with executive actions to tighten access to guns, he will lead with a measure that strengthens an astonishingly, consistently, overwhelmingly popular government policy: background checks for would-be gun buyers. 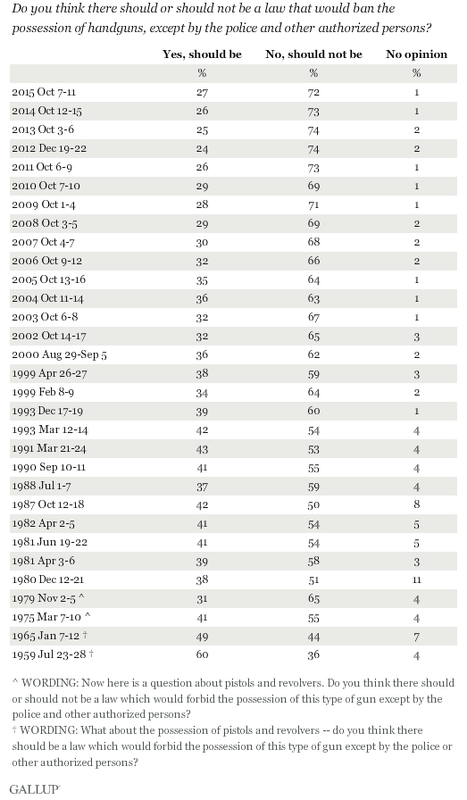 Without much hope of getting a gun-control measure through Congress (a Democratic-controlled Senate couldn’t muster enough support to prevent a filibuster of a proposed expansion of background checks in 2013, a few months after the Newtown school shooting), Obama isn’t proposing anything as extensive as the kinds of background checks Americans have been polled about. According to a fact sheet released Monday evening by the White House, the Bureau of Alcohol, Tobacco, Firearms and Explosives plans to clarify — and in many cases expand — the definition of being “engaged in the business” of selling guns, which is the criterion that determines whether a seller must get a federal license and, therefore, must check the backgrounds of would-be buyers. The White House also is proposing other measures to curb gun violence, such as stepping up enforcement of existing laws and increasing state reporting into the background-check system of people with mental-health issues that prohibit them from buying guns. But expanding background checks is the lead item in the White House’s blog post on Obama’s executive actions, in its fact sheet, in Obama’s tweet summarizing his actions and in several news articles. “It’s very hard in our partisan environment to find anything that 80 percent to 90 percent of people support,” Arkadi Gerney, a senior fellow at the Center for American Progress who formerly ran former New York City Mayor Michael Bloomberg’s group, Mayors Against Illegal Guns, said in a telephone interview Monday. So how can Jennifer Baker, a spokeswoman for the National Rifle Association, have been right when she said on Saturday, in a pre-emptive response to the forthcoming White House measures, that “the majority of Americans oppose more gun control”? (The NRA didn’t immediately respond to our request for comment Monday evening.) 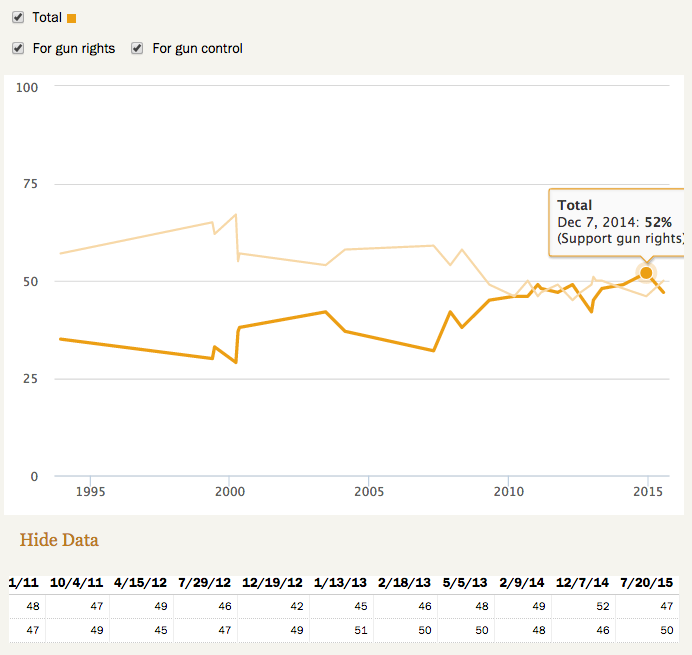 Because Americans’ responses to polls on guns aren’t always internally consistent. For instance, in that same Quinnipiac poll last month, half of respondents said they oppose stricter gun laws in the U.S. — meaning that a significant proportion of people who said they backed a law requiring background checks said they oppose stricter gun laws. That’s partly because stricter gun laws could include a wide range of measures, some far less popular than background checks. For instance, since 1959, Gallup has asked whether people think there should be a law banning possession of handguns except by police and other authorized persons. Although 60 percent of people said “yes” when the question was first asked and at least 40 percent agreed in most subsequent polls until passage of the Brady Bill in 1993, lately just a quarter of respondents back a total ban. No major party or official is calling for a total handgun ban today, but even some more limited measures that once enjoyed broad support now bitterly divide voters. From just before the assault-weapon ban was enacted in 1994 until soon after its expiration in 2004, it consistently drew support of 60 percent of Americans or more. Lately, though, its popularity has declined — so much so that more Americans opposed it than supported it in two December polls. Maybe that’s one reason background checks are so popular, including among gun owners: They’re seen as a way to control gun ownership and to protect the rights of most Americans — those Americans who pass the checks — to own guns. “If a policy is around keeping guns out of the hands of the wrong people, almost everyone agrees with that,” Gerney said.